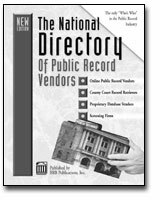 Find the "right" vendor to provide the public records you need. The Directory is divided into an easy-to-use color coordinated format. Over 14,00 county by county listings of local hands-on document retrievers. Copyright: 2003, Thomas Investigative Publications, Inc.